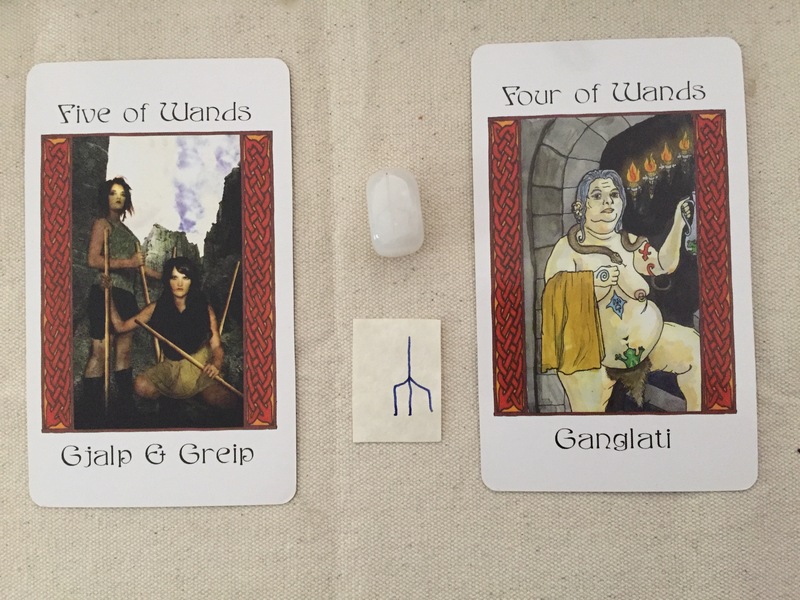 Today’s draw: Gjalp & Greip/Five of Wands; Chalc reversed; Ganglati/Four of Wands. You are running on empty, which is not the ideal way to start the week. 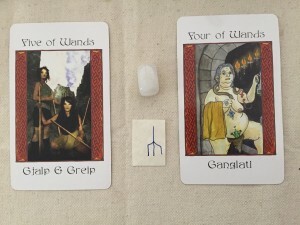 People are cranky and cantankerous, and spoiling for a fight–and you just happen to be there. Withdraw if you can. If you must engage, let the other person say their piece, and let them know you are going to take time to consider–then withdraw. If withdrawal isn’t possible, do your best to remain neutral and unmoved by the excess energy. Treat everyone with as much respect and kindness as you can muster. Rest assured, if someone feels badly treated, they will make sure everyone knows. Save yourself the aggravation of dealing with the additional mess, and do your best to be calm and focus on the problem, not the drama. Just because others are having a bad hair day doesn’t mean you have to respond at their pitch. That respect and kindness includes yourself. We can’t treat others well if we don’t treat ourselves well. Do only those things which must be done today, and give yourself permission to punt everything else until tomorrow. Have a good supper, relax after the day’s exertions, treat yourself by going to bed early. Turn off the computer, turn off the television, unplug the phone, and sleep. Waking rested and refreshed in the morning will make tomorrow easier to deal with, whatever it may bring.